We are a family-owned and operated, Massachusetts Roofing Contractor, supplying and installing Industry’s Best (IB) PVC flat roofing systems and sustainable metal roofs for both residential and commercial clients. 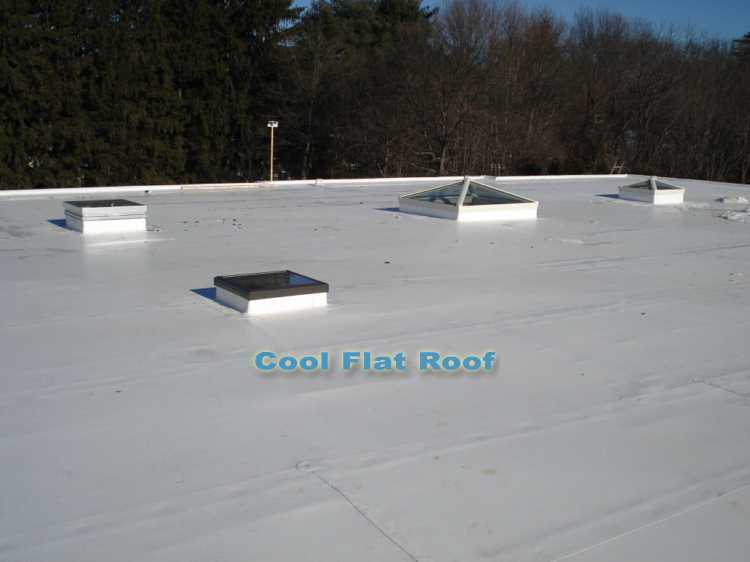 We specialize in Energy Star rated and Cool-Roof certified flat roofs, and green metal roofing solutions for steep, low slope, and flat roofs in MA, RI, CT, and NH. See the roofs we install for yourself – Roofing Portfolio – examples of flat and metal roofs we installed in MA, CT and RI along with brief descriptions of each job. Price Transparency is important, and we don’t want you to waste time calling contractors for price estimates – that’s why we created an online roofing calculator that helps you get a quick price quote without having to call 5 different roofers. Besides, most of them will something like “We don’t do price quotes over the phone”. All you need for an accurate price quote is to know your home ground dimensions. If you need a more advanced / detailed estimate, use our long form roof calculator. 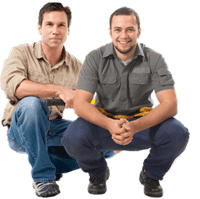 We carry all the required Commercial / Residential construction Licenses ( including MA Construction Supervisor License or CSL ) and Insurance coverage, and we are an IB Roofs’ Certified Installer. If you are located in any of these states, you can fill out our roofing estimator request form, and we will be in touch with you within 24 hours of receiving your request, with a personalized solution, tailored to your particular needs, be it a flat roof, a metal roof, a roof deck or Green/Solar PV roof. Our flat roofing product of choice is IB Cool Flat Roofs – a PVC, single-ply membrane, featuring fusion-welded seams for permanent water tightness. 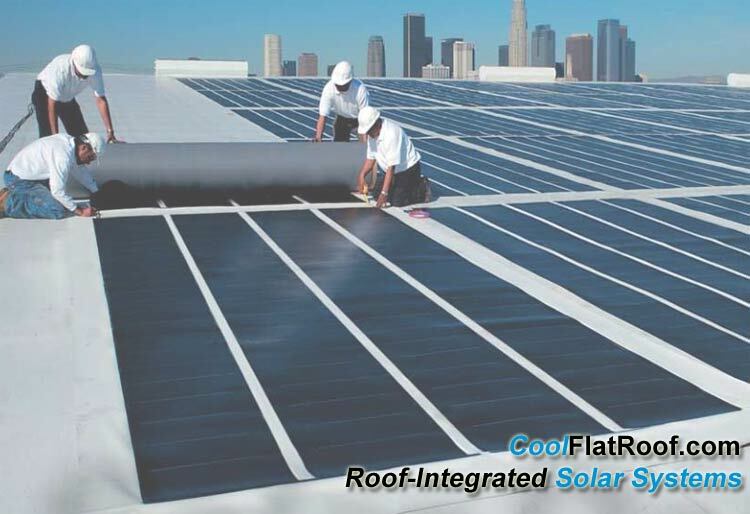 Unlike conventional roofing companies that offer a lot of different roofing products (rolled asphalt roofing, EPDM Rubber roofing, TPO, Tar and Gravel) Cool Flat Roof works exclusively with only one brand of flat roofing products – IB Roofs. IB Roof Systems is a roofing manufacturer specializing in long-lasting and energy efficient flat roofing solutions for residential homes and commercial buildings. An IB membrane works extremely well in any environmental conditions providing reliable roof protection even when your roof is covered with snow and ice, blazed by strong hail, or covered with ponding water. Our flat roofing membranes come in an impressive array of thicknesses, colors, textures and styles that will not only provide superior protection for your roof, but will also make your house stand out from the rest. Whether like us, you are ‘in love’ with IB Roofs or you are still discovering your options, you may want to check out our online Roofing Price Calculator which will provide you with an instant quote to install an IB roof, and compare prices to install other types of flat roof such as EPDM rubber, and Tar & Gravel / Built-Up Roof, as well as estimated annual energy costs savings associated with IB white roof. IB Flat roof installed on a low slope shed-dormer roof in Andover, CT.
IB energy efficient flat roofing systems can be enhanced with roof-integrated photo-voltaic solar panels that convert solar rays to electricity. This can virtually take your house off the grid, and it can even earn you credits with the electric company. Solar panels can generate and supply electricity not only to your house, but will also send the excess electricity back to the grid. When photovoltaic roof system is combined with a high efficiency Geothermal heating and cooling system, your house can become independent of external energy sources. IB SolarWise utilizing Uni-Solar thin film laminates convert sun light into electricity. We provide sustainable roofing solutions that are not only energy efficient and environmentally friendly, but can also be integrated with Green Roof Gardens at any time. Our roofs are certified by green roof Energy Star, Cool Roofing Council, Green Roofs For Healthier Cities, and other respected rating and standards organizations. IB and Green Roof Blocks make building a Green Roof simple, fast and inexpensive. Do you have a deck or a patio in your home that you need to protect with a reliable and slip proof membrane? All too often roofing membranes underneath the deck leak, creating problems. 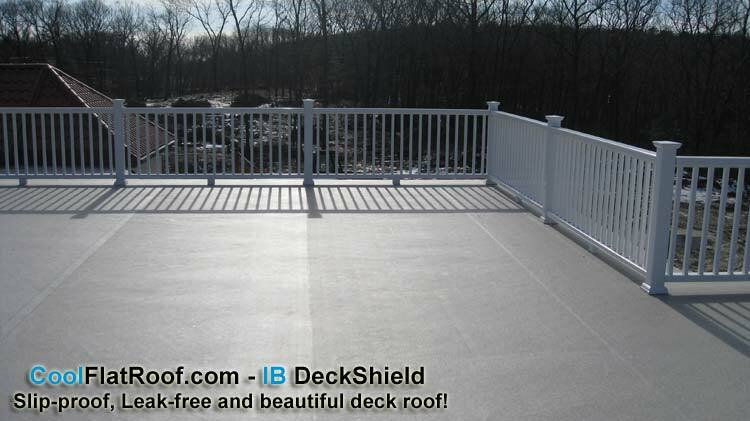 IB roof systems has developed a product called IB Deck Shield, a waterproof membrane that has a slip proof texture and can be safely walked on even when it is wet. Not all roofs necessarily need a complete replacement. If you have a fairly new flat roof, or you are not ready to install a new IB Roof, we can extend the life of your single-ply flat roofing system, by fixing your roof leaks. We provide flat roof repair services of PVC, TPO and EPDM rubber roofs around Boston MA, and when needed, will travel anywhere in Mass., Conn., and RI to fix your leaking flat roof. 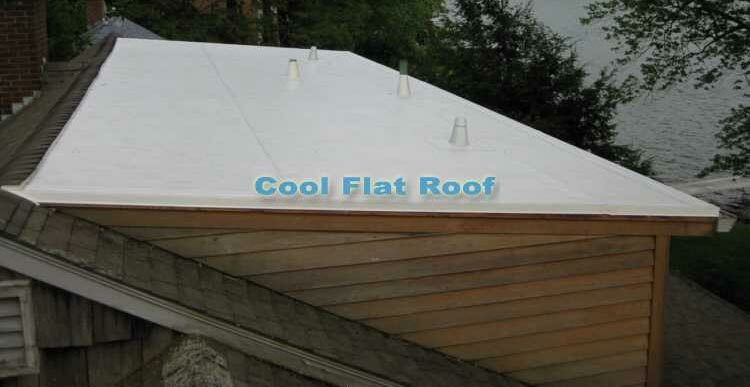 Our EXCLUSIVE rubber Roof Repair Package in THE Metro Boston area, stars at only $425. It includes 2 hours of professional roof repair work and all necessary EPDM rubber materials / flashing accessories. Metal Roofing systems we install will provide long lasting and reliable protection for your sloped roof, keep your house cool, and help you save on energy costs. In the winter, metal roofs help prevent and eliminate Ice Dam related roof leaks, by shedding snow and ice from your roof. Integrated with breathable synthetic roof underlayment, our metal roofing systems will improve your attic ventilation and extend the life of your roof deck. Our wide selection of metal roofing colors, and options can accommodate, provide reliable and long lasting protection for any house, and commercial building. All our metal roofing packages include GAF DeckArmor breathable synthetic underlayment, metal roofing shingles or panels, all necessary trim, and a ridge ventilation system. Our custom sheet metal fabrication shop enables us to fabricate customized metal roofing system to suit any roof type, and building structure. 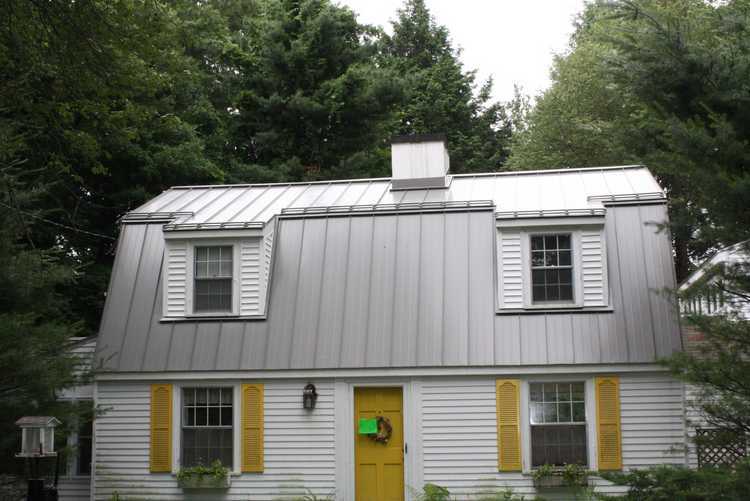 Best part of all, our established relationships with metal roofing manufacturers and suppliers, allow us to offer our metal roofs at competitive prices, and at lesser mark up than competition. Learn how we install metal roofing systems for our customers, paying special attention to details, which other roofers ignore. 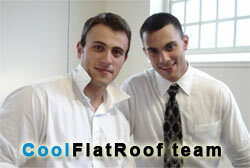 Discover why our roofs are truly lifetime and our customers are happy! Specialty Metal Roofing: Copper, Zinc. Small High-End projects, Bay windows, porches, etc. Massachusetts Flat Roofing – We install IB Flat Roofing Systems and different styles of Metal Roofing in Metro Boston, North Shore, South Shore, Metro West, Worcester area, all of Cape Cod and other regions of MA. Connecticut Flat Roofing – We provide roof installation services in Hartford, New Haven, New London and other counties of CT, and will travel as far as Danbury and Stamford. Rhode Island Flat Roofing – Serving all regions of Rhode Island, including metro Providence area, Pawtucket, Cranston, Warwick, Newport and the rest of RI.